Imagine never having to take the time to wash and dry your hair ever again. No, you wouldn’t have to shave your head – just switch to dry shampoo, a spray-in product that advertises some of the same benefits as the wet goop you slather over your head. These alcohol- or starch-based sprays claim to nix the grease and oils in your hair while adding volume. They also seem to fall in line with the trend toward less frequent wet shampooing. We know they’re safe for all types of hair, but does shaking in some dry powder every few days keep your hair and scalp healthy? According to dermatologist Wilma Bergfeld, MD, the answer is no – at least not for long. Shampoos come in a variety of formulas, including anti-dandruff shampoos that clean up scales, germs and yeast that collect in the hair. All other shampoos, she says, are detergents that liquefy the oils and other debris in your hair. Dry shampoo works simply: the alcohol or starch in the product soaks up the excess oil and grease in your hair, giving it a cleaner, fresher appearance. Traditionally, shaking corn starch into hair has achieved the same effect, but most current products deliver the drying agents via an aerosol spray. In addition to supporting the hair-care industry’s push to minimize the use of oil-stripping shampoos, there are some cases where dry shampoo is the preferable option, Dr. Bergfeld says. For example, if you’re traveling and a shower isn’t an option or if you’re hospitalized and unable to bathe, this type of product can help maintain your hair and scalp. But, only for a little while. According to Dr. Bergfeld, dry shampoos not only build up a residue in your hair that can make your scalp feel and appear sandy and grainy, but the products also may dry out your hair, making it brittle or fragile. If the hair is dry and there no added moisturizing substance, the hair fiber will fracture, and you’ll have a headful of broken hair, she says. Dry shampoo products can also leave a residue on the scalp as scales or scalp rash leading to inflammation that reduces hair growth. At most, she says, you can consistently use a dry shampoo product for no more than three months – and not every day. While spraying, keep the canister at least 6 inches from your scalp. After spraying, massage your scalp to evenly distribute the product down to the roots. Carefully and gently brush through any patches that have too much dry shampoo added. Don’t spray the ends to avoid extra dryness or static. Add a pea-sized amount of coconut oil or hair conditioner if the tips feel too dry. Use no more than two days in a row. 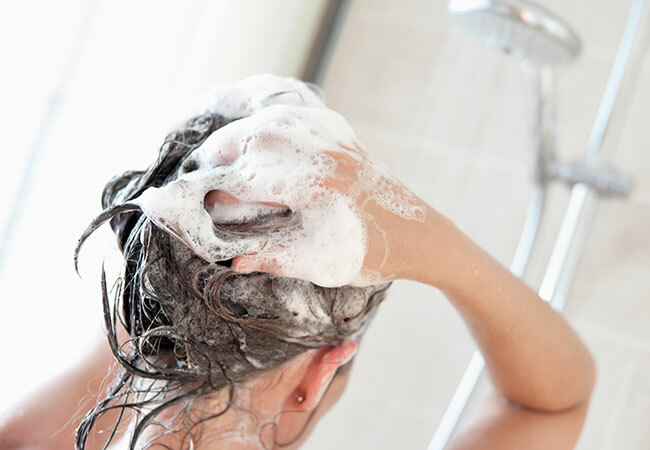 Shampooing hair is critical to removing the dirt, bacteria and yeast that can build up on the scalp. Repeatedly adding topical products to the scalp, such as oil, clogs pores and creates opportunities for pimples or bacterial infections, Dr. Bergfeld says. Add in hair sprays, volumizers and other hair-care products, and the scalp develops a film that must be removed. It’s true, in the short term, that dry shampoos can safely mask the appearance of debris in your hair. But ultimately, it becomes a contributing factor. Using them forever isn’t a good option. Only a wet shampoo can truly cleanse the scalp, she says. “In my opinion, you have to wash or shampoo the scalp once in a while to have healthy hair and scalp skin,” Dr. Bergfeld says.